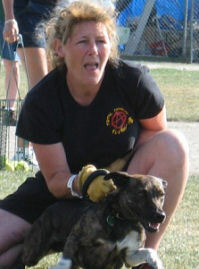 Flyball is a team sport consisting of four dogs, two "spare" dogs, and their handlers. It is a relay race between two teams where the dogs run over four hurdles, retrieve a tennis ball from a spring loaded box, and then return the ball to the handler by running back over the jumps. The first team to have all four dogs run without errors wins the heat. Flyball was invented in California in the late 1970's. After a demonstration on "The Tonight Show", the game of flyball soared in popularity. The first flyball tournament was held in 1983. Two years later, the North American Flyball Association (NAFA) was formed to standardize the rules, keep track of tournament scores, and guide the direction of the sport of flyball. There are now over 700 teams and over 16,000 dogs registered with NAFA! The sport is not limited to any one breed of dog; purebred and mixed breeds may compete. Teams compete in divisions against other teams of equal ability, and earn points towards NAFA titles. 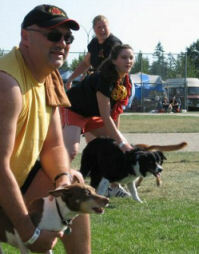 The sport is competitive and fun, providing endless hours of enjoyment for dogs, their handlers and spectators alike. Time is monitored by electronic sensors, activated by the first dog breaking the sensor (starting line), and the time is stopped when the last dog comes back. A dog will have to re-run if he makes a mistake. This could be dropping the ball, missing one or more hurdles, or starting too early. The extra time is added to the total time for the team. Any ball (any size) can be used, so long as it will bounce and roll (like a tennis ball). There are 5 judges per ring (2 line, 2 box line, and one official judge). The fastest time recorded for a team of four dogs is 15.22 seconds, run by Springloaded on July 16, 2005. Each dog earns points every time a team races in a NAFA sanctioned Flyball tournament with a recorded time.